Open designs blend Balinese ambiance with western comforts at the modest but appealing 2-bedroom Rumah Campur, one of three rustic villas within a peaceful, managed compound overlooking gleaming rice paddies. Relax by the garden pool or wander through the tranquil village of Seseh down to the beach and crashing surf. Relaxation comes naturally at Rumah Campur. The Dutch owner designed it as a functional holiday home for couples or a small family group, so despite its limited size there's a good choice of spaces to relax in comfort: on sun beds by the pool between refreshing plunges, in the shady gazebo (which is also perfect for yoga) or on the terrace that fronts the master bedroom. Thoughtful additions like the mezzanine sleeping deck at the rear of the main bedroom make this a good choice for a small family, as does the modest air conditioned library and TV/DVD den below the mezzanine: just the place for the kids to slob in front of a movie. In the living area, a comfortable sofa and floor cushions provide yet more options for private time with your book or laptop (WiFi throughout) while a wooden, six-seater table is perfect for relaxed dinners – the open space around it catching the cooling breezes so you rarely feel too hot. Rumah Campur is ideal as a simple but comfortable and convenient holiday retreat. The daily maid will shop for – and prepare – breakfast and lunch (provisions at cost plus a small service charge) and you can easily hire a cook via the managing agents for more elaborate evening meals should you with to savour the flavours of Balinese cuisine. 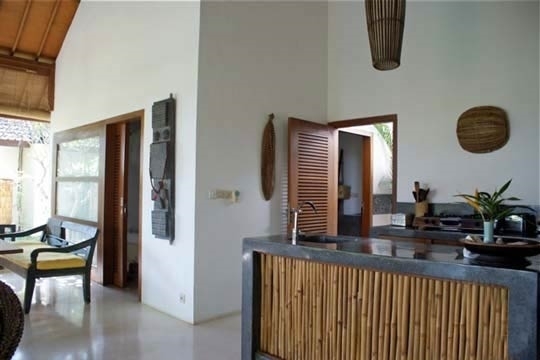 Self-catering is also an option, and there's a well-equipped kitchen and separate pantry at your disposal. The pool and gardens are peaceful and private, but having the management office on-site you're never without English (and Dutch) -speaking assistance. 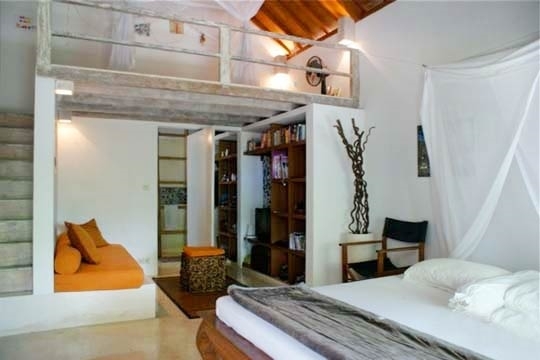 Campur means 'mixed' in Bahasa, and this simple, rustic villa with its two double bedrooms and useful mezzanine area, offers a whole host of pleasing combinations. The design fuses indoor and outdoor ambiance so you never feel closed off from nature. Traditional Balinese accessories add local charm and are complemented with modern western fittings to make your stay more comfortable. 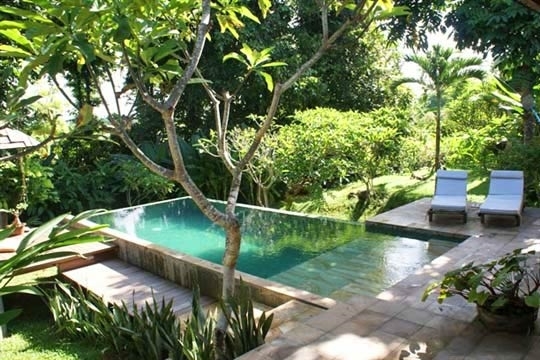 In spite of its secluded location the house is only eight kilometres from the popular surf beach at Canguu, and 15 kilometres from the bustling streets of Seminyak. 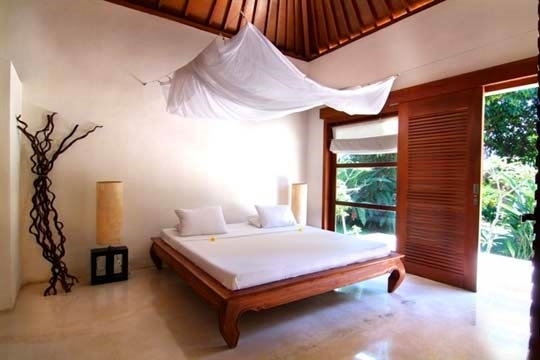 Much of Bali's appeal comes from the simple way of life and Rumah Campur allows you to fully appreciate this without sacrificing too many comforts. We quickly slipped into a relaxed routine, dividing time between the pool and a good book, bathing in sunshine and birdsong and savouring the cook's tasty local dishes. The villa is as much a romantic retreat as it is a family one: strolling down to the beach to watch sunset, then returning for a quiet dinner under the stars would certainly set the scene perfectly for any marriage proposal. Mornings are ushered in with dove calls and if you can drag yourself from slumber at sunrise and open the blinds, the backdrop of dappled green will wake even the most jaded soul with a smile. Children have plenty to keep them occupied between the pool, garden and watching DVDs in the den. The owners actually lived in the house for a year with their kids and made modifications to suit - like the mezzanine sleeping deck in the main bedroom. 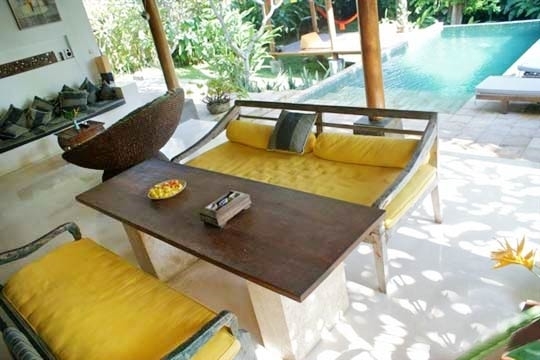 If younger guests do get restless, you can always nip to the site office, which is open all day and manned by friendly, helpful staff, and ask them to book you for a horse ride at the nearby stables, call a taxi to take you to the beach at Canggu (8km), or even to go shopping in Seminyak (15km). Staying in a village brings you into close contact with Bali's rich, local culture: there are ceremonies and offerings at the nearby temples almost daily. We were there during Nyepi, the Balinese New Year festival, and ideally placed to witness the famous, hand crafted Ogoh-Ogoh demons being paraded through the country lanes. On the day following the parades, no-one is allowed to venture out of their homes and only candles can be burned for light at night. At Rumah Campur, rather than being a drag, this only added to what was already a supremely peaceful and authentic Balinese experience. For the price this is a very attractive alternative to hotel accommodation, a private pool and a choice of relaxation spaces mean you don't feel cramped even though the house is not very large. The open-plan design and garden setting suit the peaceful, authentic surroundings and having the management office on site means that even though there are no full time staff, you have access to all the help and assistance you need. The beach at Seseh (400m) is not really for sun bathers and unsafe for swimmers: it's more of a surf beach, and not very clean. There are no restaurants close by, so hiring a cook or self-catering for dinner is the best option. Rumah Campur is one of three villas (which include Terang Bulan) that look out eastwards across the sprawling rice fields on the edge of the sleepy village of Seseh. As the village consists of little more than a collection of small houses, there is little to do in the immediate area other than enjoy the peace and quiet or take a walk through the rice fields. Seseh Beach is a short walk away (400m) and is good for surfing (though not safe for swimming). Bali’s west coast is famed for its beautiful sunsets which can be enjoyed from the beach in Seseh. You enter Rumah Campur from the compound's gated driveway, walking between the villa and its neighbouring property (which is shielded from view by tropical plants). To the left, a couple of steps lead up to an open-sided, kitchen/dining/living space overlooking the pool, terrace and small garden. 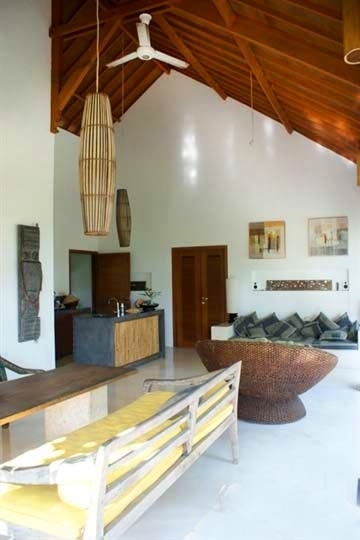 A vaulted ceiling covers this area, which features a six-seater wooden dining table with cushioned benches, plus a lounge space with a built-in sofa, an inviting circular rattan armchair and floor cushions. The kitchen serves the living space from a recessed area fronted by a granite breakfast bar with built-in sink, oven and simple gas hob. There's also a pantry behind the kitchen with storage space for crockery, cutlery and provisions. Access to the two air conditioned double bedrooms is through doors from the main living area. Directly behind the dining space (with a curtained window for privacy) is the guest bedroom, with king-size bed, built-in storage and washbasin. 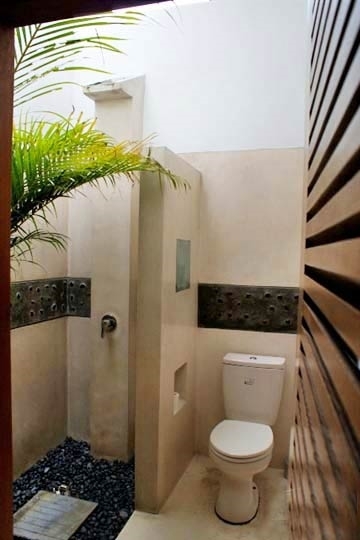 This room’s open-air ensuite bathroom has a waterfall shower and black pebble floor. The bathroom can also be accessed via the kitchen, so visitors don't have to walk through the bedroom. The spacious main bedroom, also with king-size bed, is at the far end of the living area. Steps ascend to a mezzanine deck for kids (mattress with netting) while the space beneath has been converted into a library and TV den (DVD/CD, but no satellite) with built-in sofa. This opens into an indoor ensuite with shower and more storage spaces while, at the front of the bedroom, wooden doors slide open onto a terrace overlooking the garden and pool. 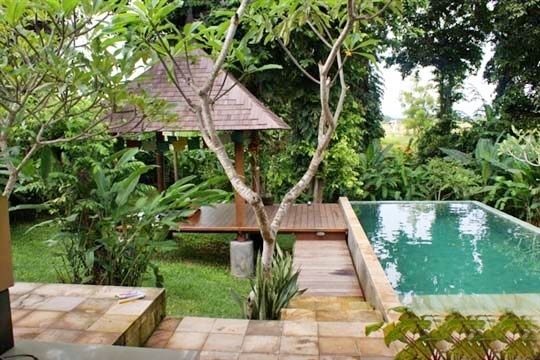 The villa's pleasant eight-metre swimming pool is surrounded by trees and tropical vegetation. Steps lead gently from shallow to deeper water, making it safe for younger children to play while supervised. Two sunbeds sit on a raised deck that extends from a modest terrace in front of the building, while a relaxation gazebo at the far end is large enough for three people to lounge on cushions or even practice yoga. 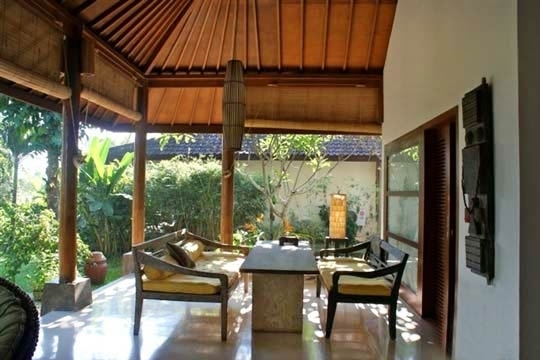 2 bedroom villa located in Seseh-Tanah Lot, Bali. Ideal for Beach in ten, Body and soul, Kid friendly, Romantic retreats, Sensible for seniors, Room with a view.